Transfection of physiologically relevant primary cells or stem cells is typically a very difficult task using traditional transfection methods. Additionally, when using relevant cell lines as model systems, the critical issues are to achieve reproducibly efficient transfection with high levels of viability while matching throughput capability required at each project phase from proof of concept, through to scale-up and screening-like approaches. With the electroporation-based Nucleofector™ Technology primary cells and stem cells, as well as cell lines, can be consistently transfected at high efficiency. 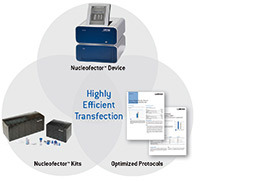 Developed in 1998, Nucleofection™ has evolved through continuous innovation into a comprehensive portfolio of devices and kits for many different transfection needs. Electroporation is a transfection technology based on the momentary creation of small pores in cell membranes by applying an electrical pulse. Lonza's Nucleofector™ Technology is an improved electroporation technology that can help you achieve transfection results never before possible in primary cells, stem cells and hard to transfect cell lines with standard electroporation. In contrast to classical electroporation, with Nucleofection high efficiencies can be reached using much lower substrate amounts and with only moderate impact on viability. The comprehensive way in which Nucleofector™ Programs and cell type-specific solutions are developed enables nucleic acid substrates delivery not only to the cytoplasm, but also through the nuclear membrane and into the nucleus. This allows for high efficiencies up to 99% and makes the transfection success independent from any cell proliferation. The Nucleofector™ Device delivers unique electrical parameters. The electrical settings are pre-programmed for each optimized cell type and can be selected via the device or PC software. We offer three different device platforms plus an add-on device.